Summer is really here. July 4th is this week, and people are lighting up their grills all around. Today I stopped by Brooklyn Kitchen. I was looking for one thing, and fell upon another: CHEESE DOGS. My grandma Baba used to make a microwave cheese dog for me when I was a kid. She’d slice open an Oscar Meyer wiener, filling it with American Cheese, and nuke the puppy for a minute. In contrast, the dogs I got today are a little more sophisticated, pre-stuffed, a lot more natural, and I prepared mine on a cast iron skillet. At this point in my life, eating a hotdog is really a thinly disguised excuse for me to eat a grand amount of sauerkraut. As if I need an excuse…. 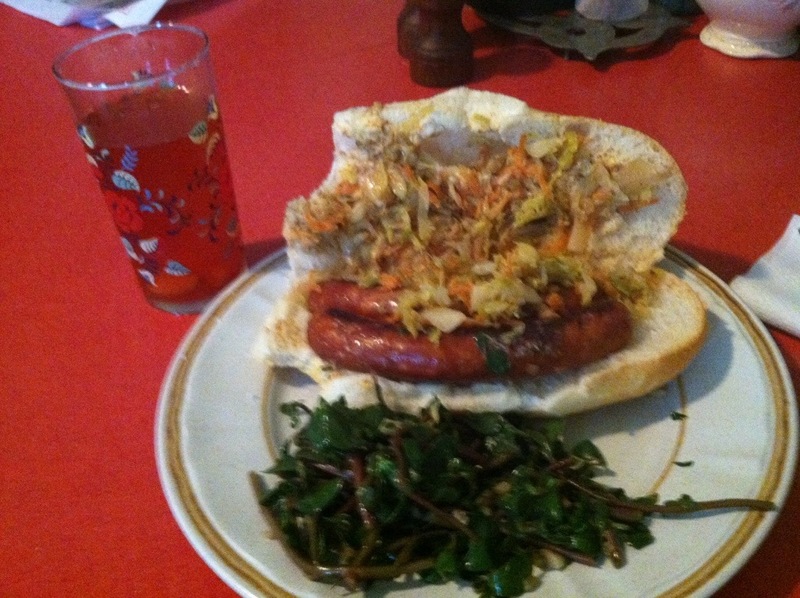 Some time ago, I wrote up a master recipe for sauerkraut. My recent creation is a little more embellished, although the basics remain the same. Scrub clean 1 carrot and 1-2 burdock roots. You don’t need to peel them. Grate the carrot and the roots. I use a box grater on one of the courser settings. Kraut can last a long time in the refrigerator once it is done fermenting. I made a large batch last year that took me about 6 months to finish, and it was none the worse for wear. The one problem you might come into contact with is mold. I made a batch of my basic kraut, only using red cabbage, back in March, and somehow it hasn’t had much luck. I’m not sure why, except that maybe it’s always been a little low on fluid. The good news is that mold only grows where your veggies are exposed to air. The stuff under the brine is just fine. I’ve kept eating this one, carefully skimming off the mold when it grows. White mold, according to other fermenters I’ve talked to, is pretty innocuous. If you have blue mold, that’s a case to throw it out. The stuff below looks blue in the picture, but that’s just because my camera is picking up the hues of the purple cabbage underneath. 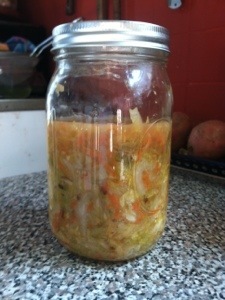 My latest completed project is a batch of saurkraut: just in time for Memorial Day barbecues. It’s a no-fool recipe, but a rather labor-intensive processs. The finished product can last for months, so it’s a good investment. This recipe makes a quart. Shred 1 head of cabbage. You can use a mandoline or food processor: I just use a knife. Sprinkle 4 t salt over the shreds, let it sit for about an hour so the salt starts to break down the cabbage. Massage the cabbage thoroughly, then pound it. This is the laborious part. It might take a good 45 minutes to pound down. Thus, sauerkraut is a good way to work out any pent-up anger you’ve been holding onto…. 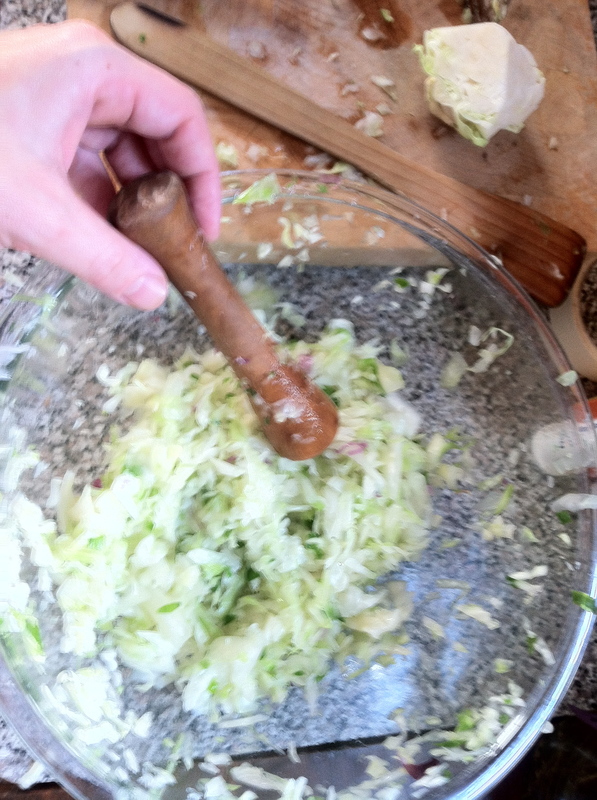 Pounding the kraut: I go back and forth between a pestle, a wooden spoon, and a potato masher. 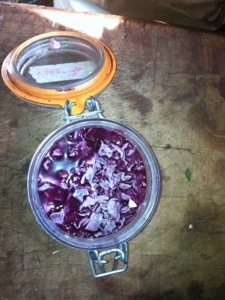 This is not the whole batch you are seeing: much of the cabbage has already been added to a jar. When it gets really wet, stuff some of the cabbage in a quart-sized wide-mouthed jar. Keep pounding it until the juices from the cabbage start to rise above the vegetable mass. I recommend wearing an apron, as this can get a little sloppy. As you have more juice, keep layering more cabbage into the jar. Continue to pound until you have fit all the cabbage in. Press the cabbage down below the brine you’ve created, and use a water-filled jar as a weight to hold it down. Here the cabbage has been pushed below the brine. For this recipe, I used two pint sized jars instead of a quart sized jar. I added a tsp of caraway seeds to one of the jars for me, and left the other jar plain for my caraway-phobic boyfriend. Those are caraway seeds you see floating on the brine. You may want to cover this, as fruit flies find it very interesting. Let kraut sit at room temperature for at least a week, making sure that the liquid stays above the level of the cabbage. You may see some bubbly action on top. This is normal. After the week is over, taste it, see how you like it. If it’s too tough or not sour enough, let it stay out longer. 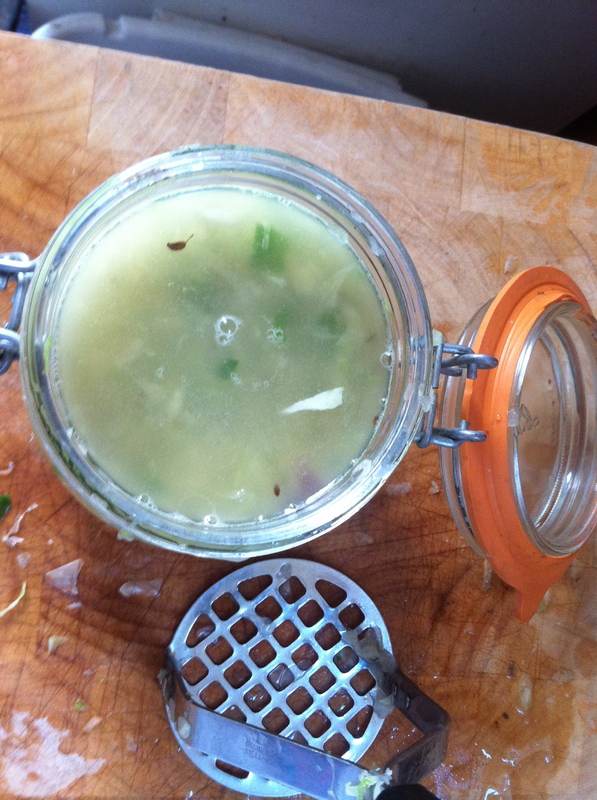 Cover your jar and refrigerate when the kraut is fermented to your liking. Variations: Red cabbage makes a beautiful and more colorful sauerkraut. You can also add things like shredded carrots or beets, though beets will turn it Very red. Caraways seeds, dill, or other spices could also be added.